“PC Data App” is a malicious software that, once it gets installed on your computer, it modifies your computer settings in order to gain money by displaying pop-up ads or by redirecting your searches into advertisements from unknown publishers. If a computer is infected with “PC Data App” adware, then more pop-up ads are displayed on the victim’s computer screen and the computer speed is slowed down due to the malicious program running on the background. PC Data App adware software installer may install additional plugins (toolbars, extensions or add-ons) inside the Web browser in order to present unwanted advertisements to the computer's user. Adware programs like this, may contain malware (malicious software) in their code in order to compromise the computer's security and make it vulnerable to hackers or malicious Internet attacks. Technically, “PC Data App” is not a virus and is categorized as a malware program (“Potentially Unwanted Program (PUP)”) that may contain and install malicious programs on your computer, like adware, toolbars or viruses. READ VERY CAREFULLY the Terms and Agreements before clicking “Accept”. Step 1. Remove PC Data App adware with with RogueKiller. 5. Finally, when the full scan is completed, press the "Delete" button to remove all malicious items found. Step 2. 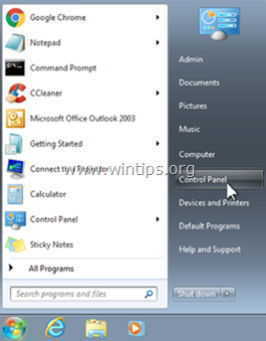 Uninstall PC Data App from your Control Panel. Step 3: Remove PC Data App adware with “AdwCleaner”. Step 4 – Reset Internet Browser Settings. To ensure that “PC Data App” infection is completely removed from your Internet browser, reset your Internet Browser Settings to default. How to remove Ads by PC Data App from Firefox. Step 5. Remove PC Data App malicious files with Malwarebytes Anti-Malware Free. 4. When the scan has completed, first press the “Quarantine All” button to remove all threats and then click “Apply Actions”. 6. After the system restarts, run Malwarebytes' Anti-Malware again to verify that no other threats remain in your system. « Remove "Flash Video Downloader is required…" malicious pop-up. » How to disinfect -almost- any infected computer using Hiren's BootCD.